Gold is a noble metal soft yellow. Nobility of this metal is estimated that it is resistant to aggressive media, i.e. not oxidized under the influence of acids and alkalis. 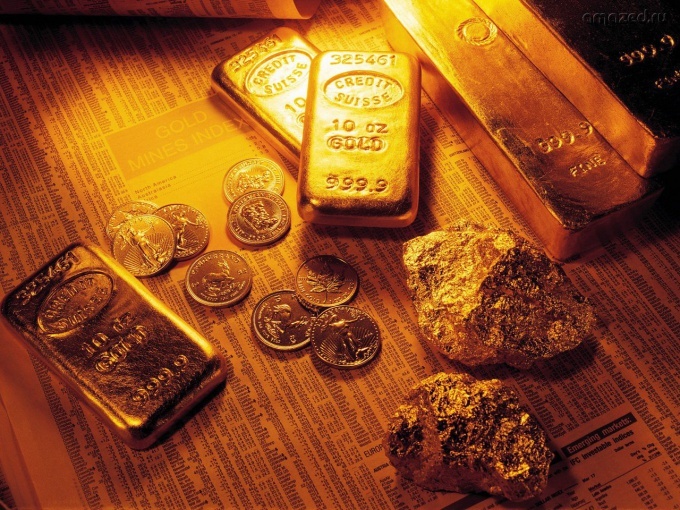 Extracting gold from gold-bearing materials in two ways: mechanical (manual) or chemical. Nitric, sulfuric, hydrochloric acid, glass container, magnet. Remove the gilding metal products. Take any plated product and place it in a glass bowl. Then, gently pour into the container of nitric acid (pour the acid portions) so that it completely covered the product. Will the reaction starts with the dissolution of the metal, which is coated with gold. After the reaction, when the metal is dissolved at the bottom will be gold, which was covered with metal. Pour the solution separated from the precipitate. Rinse the gold with water. Select gold from gold-bearing sand. Scatter the gold sand on the table and swipe it with a magnet. All ferromagnetic materials will be attracted to it. Next, treat the sand with diluted sulfuric acid. Acid-soluble substances go into solution, and will not interfere with subsequent stages of the processing. This will further strengthen the gold-bearing sand. Then, prepare the Aqua Regia. Mix one part concentrated nitric acid and three parts concentrated hydrochloric acid. Pour the solution of gold-bearing sand. When gold is dissolved in Aqua Regia, it will be in the form tetrachloraurate acid. Evaporate the solution at the bottom will remain crystals. When further heated, the acid decomposes with the release of trichloride of gold, which, in turn, with 254 degrees disintegrate to chlorine and pure gold. Wash the residue with water. These manipulations spend outdoors, as the products of evaporation are harmful to health. Use protective equipment when working with acids.